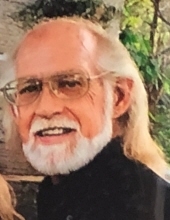 David Wayne Ridge 59 of Rock Falls went to be with Jesus on Friday, November 9, 2018 at OSF Peoria. A Memorial visitation celebrating Dave's life will be 4-7pm on November 16, 2018 at Victory Baptist Church, located at 505 W. 7th Street Mendota. Dave was born July 23, 1959 in Mendota to Oral and Lois (Jacobs) Ridge. He attended Mendota High School and worked at Motor Wheel. He is survived by: his wife: Elizabeth Ridge of Rock Falls; one daughter: Brandy Day of Peru; one son: David Ridge of Mendota; one granddaughter: Devyn Robeson; his mother: Lois Ridge of Mendota; two sisters; Debra (Roger) Haas of Mississippi and Peggy (David) Lawson of Mendota and several nieces and nephews. David was preceded in death by his Father: Oral DeWayne Ridge. Memorials may be directed to the family courtesy of the funeral home. To send flowers or a remembrance gift to the family of David Wayne Ridge, please visit our Tribute Store. "Email Address" would like to share the life celebration of David Wayne Ridge. Click on the "link" to go to share a favorite memory or leave a condolence message for the family.